Car speakers for your stereo system. Replacing your factory speakers can be one of the best upgrades for your car audio system. Subwoofers can easily overpower the rest of your system especially if you still have factory speakers. Adding aftermarket car speakers will help you cut through overpowering bass. 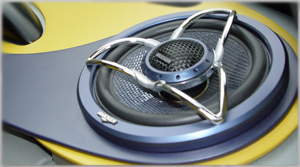 We also stock component speaker systems that can be custom installed for amazing sound quality. Beautiful sounds as you drive can make the whole trip so much more pleasant. Even if you love hard rock pounding out the rivets on your cowling or Acoustic Alchemy putting you in an alpha state, great car speakers can be appreciated by all. Sizes, shapes and ratings can all have an effect on the quality of sound you will end up getting. In addition, the particular configuration you select will also have an effect. The kind of music or audio you love as well as your budget and type of vehicle will have a strong influence on your choices. Let's look at some of the overall options when it comes to setting up your car with speakers that will move you. Have you ever seen speakers sitting on the dashboard of a vehicle? How about those that sit in the back window? Unless you drive a big van, most car types will limit the size and placement of car speakers. One of the most popular configurations for 4 speakers in a car includes one in each front door and 2 in the rear deck. This provides the ability for the people in front to control left and right balance and front to back balance. Normally, the speakers in the front of the car have the higher tones and those in the back are often bigger and can carry the lower tones. There is another common option for people that love powerful sounds that includes a subwoofer in the trunk. This is a special speaker, large in size, that can give you a thumping kind of shaking like in a nightclub. Once you experience this, you either love it or hate it. This large single speaker is only there to enhance the whole experience and does not reflect the qualities of left and right stereo separation. Of the many types of car speakers, perhaps the most popular are the 6x9 speakers. These speakers measure 6" by 9" and provide wonderful sound for any music lover. They are also pretty much the biggest of the common sizes. In contrast, there are tiny 1" speakers sometimes called Tweeters that carry the very high notes to your ears. These should not be obstructed by car seats or headrests and normally sit on or above the dashboard in custom configurations. If there are passengers in the back, they rarely hear them clearly because the high notes don't travel well through any materials. In contrast, the low notes of a subwoofer can pound from the trunk as they have a tendency to shake the whole car. Some more popular sizes are the round 3.5" speakers. These are great for tweeters because they share the high notes most effectively. There are 6.5 speakers as well that are good at sharing the mid-range. Sometimes, you can find speakers that have an oblong shape like the earlier mentioned 6" by 9" inch variety. These also come in 4x6 speakers, 5x7 speakers, 6x8 speakers and even 4x10 speakers sizes. These often have a small tweeter cone mounted in the middle and above the main cone in order to enhance the high notes and create more tonal balance. Selecting the right speakers for your car involves several factors. First, think about what kind of sounds you like the most. Also, outline a budget so you know how much you have to spend. Research the kind and size of speakers that will fit in your particular vehicle and consider if you want the sounds to also be strong in the rear of the car if you often have passengers sitting there. Once you have it all installed, sit back and enjoy the tunes. You're wired for great car audio sound.